At www.searpubl.ca you will learn how orthomolecular medicine restored my mental health. I work in Toronto as a consultant. A third of my clients have brain conditions. During their episodes of depression or anxiety, I coach and monitor their progress. I write the SEAR series of articles, books and reviews to help people avoid problems, misdiagnoses and mistreatments. Finding Care for Depression, Mental Episodes & Brain Disorders and The 90-Day Plan for Finding Quality Care come with a healthcare compass, a planner and many references. For 28 years, I suffered with a bipolar II mood disorder. Psychiatrists and psychologists never mentioned restorative care. I trusted standard treatments but got worse. Doctors watched the deterioration. Desperate for help,I updated my degree in biological and medical sciences by reading psychiatry and psychology books. I learned about mental illnesses and hoped to find restorative care. During interviews with >150 people, many of them shared similar problems. Eventually, books explained how some health professionals use nutrients to heal. Their scientific research and medical discoveries led to orthomolecular medicine. After 50 years of research, development, progress and success, with thousands of patients helped, why does restorative care remain little-known? Why keep it secret? Orthomolecular Recoveries x36, a short reading list, shares 36 stories written by people who recovered from depression, bipolar disorder or schizophrenia. (See pg. 7 for 36 antidotes to secrecy.) Recommended reading! Autumn Stringam, from Calgary, wrote A Promise of Hope after her recovery from a bipolar mood disorder. Her mother’s suicide, while struggling with a bipolar illness, left several children who were also bipolar. Autumn’s desperate father found a chap who knew that nutritional supplements could calm stroppy pigs. Even though Autumn was reluctant to stop taking her antidepressants and other medications, the ‘pig pills’ helped her recover. These same supplements have since helped many people with bipolar disorders. The first medical researchers to test the regimen noticed that nutritional supplements helped some bipolar patients; the scientists recommended further studies. Health Canada tried to stop this treatment, pending drug-number approval. An Alberta court found in favour of using supplements to help bipolar patients, while research continues. Autumn wrote a superb account of her experiences with bipolar disorder and her astonishing recovery but her book does not explain how supplements can restore brain chemistry. Fortunately, many other books have that information. In 1998, I appeared in Masks of Madness:Science of Healing, a documentary about orthomolecular medicine, featuring Margot Kidder as host and narrator. She used nutritional supplements to recover from her bipolar disorder. In the film,2 bipolar and 6 schizophrenic patients report their progress and 6 health professionals explain orthomolecular care. You can order the Masks film from the International Schizophrenia Foundation (416) 733-2117. While researching schizophrenia, biochemist and psychiatrist Abram Hoffer, PhD, MD, FRCP(C) discovered that nutritional supplements can restore mental health. Adventures in Psychiatry: The Scientific Memoirs of Dr. Abram Hoffer shares his life’s work and lists his published books and articles. We can learn a lot from Dr. Hoffer. Forty years after he co-founded orthomolecular medicine (in the 1950s) he appeared in the Masks film.Hoffer and his team of health professionals (physicians, biochemists, psychiatrists and nurses) researched and developed restorative regimens, networked and helped thousands of patients. Abram Hoffer wrote more than thirty books and six hundred medical journal articles to share his research, discoveries and recoveries. For decades, he spoke to health professionals, patients and families at meetings, conferences, workshops, seminars and lectures. Dr. Hoffer established a worldwide network of orthomolecular doctors who treat patients restoratively. You can meet them at annual conferences where people gather from around the world to discuss orthomolecular research, development, progress and success with health professionals, recovered patients and families! On April 22, 2007 (at the 36th conference in Toronto), I spoke after Margot Kidder at the Mental Health Regained workshop. After 30 books, double-blind experiments, 600 journal articles, many talks and the Masks film, the secret is out — orthomolecular medicine works! If so, why don’t conventional psychiatrists study the references and offer restorative care? Modern psychiatrists are busy. With full practices, they label patients and prescribe medications, apparently too busy to learn how supplements can help. Where does this leave sick patients and trusting families? Wandering the mental healthcare maze, hoping for quality care but getting labeled and medicated. “The D.S.M. Diagnostic and Statistical Manual lists many labels for patients with brain problems. After psychiatrists pick a diagnostic label, they prescribe one or more medications. Label and medicate – quick and easy. Efficient, but does this heal? Medications help but what if a bipolar patient gets an antipsychotic (such as olanzapine) along with an SSRI antidepressant (such as sertraline)? Two meds combine their effects (beneficial as well as problematic). Some patients have problems after drug-induced side attacks. e.g. akathesia with hypomania. Bipolar patients often get several prescription medications. Do not question the psychiatrist before you study the medications. You will be surprised what you can learn, by reading books and guidelines. e.g. SSRI antidepressants may not help a bipolar disorder unless given with a mood stabilizer. According to psychiatrist Dr. David Healy, antidepressants were developed in Europe after World War II when chemical companies turned left-over rocket fuels into brain pills! Bipolar patients typically get 2, 3 or even 4 meds. Psychiatrists, who regularly lecture at the Mood Disorders Assoc. of Ontario, admit to not knowing how these medications work. Why would psychiatrists treat sick patients with pills whose effectsthey cannot explain? Why give a bipolar patient the pill for another illness i.e. an antipsychotic for schizophrenia? Why shortcut the practice guidelines of psychiatry which recommend testing and diagnosing before prescribing? Why mix meds without trying to identify the root cause(s) of brain symptoms? Who benefits by rushing, drugging and mixing meds? Ask your doctor to show you any scientific and medical research supporting multiple meds. What if he can’t? What happens if busy psychiatrists label sick patients and prescribe medications before doing diagnostic work-ups? Do their patients get ‘quality’ care? After experiencing substandard shortcuts, I found journal articles which report that psychiatrists often do not follow practice guidelines with bipolar outpatients. Why not offer guideline-quality care? The experts don’t say. If this happens to you, do not panic. Do not complainor your psychiatrist might prescribe more pills to treat your oppositional defiant disorder! Instead the patient / family caregiver / advocate can remain calm and learn (by reading). The SEAR site suggests books so you can study the standard treatments and restorative care. Modest doses of medications help many patients, after diagnostic tests and medical treatments. Each patient responds differently so it makes sense to learn the side effects. Do NOT go off meds UNTIL you get properly diagnosed and treated for underlying medical or metabolic conditions and stabilized on a restorative program. Even then, many patients still need to take pills to keep well. A supplement regimen can complement meds thereby allowing a patient to benefit from prescription drugs, cooperate with talk therapy and recover using restorative treatments. On lower doses, patients have fewer problems with side ‘attacks’ than they do while taking high doses of medications or mixing pills. Perhaps you have already been tested, but even so, it makes sense to update your medical tests and re-check your hormones, thyroid gland and blood sugar to see whether lingering metabolic or other medical problems might be causing or contributing to your symptoms. Patients can ask for tests, see the test results, track their progress, and request copies of their medical files. Jonathan Prousky, Chief Medical Officer of the Canadian College of Naturopathic Medicine, knows about orthomolecular medicine. He sees patients at the CCNM clinic (Leslie and Sheppard, Toronto). You can call Dr. Prousky at the college. Tell him who referred you. Ask about his books and articles. e.g. Anxiety: Orthomolecular Diagnosis & Treatment and Naturopathic Nutrition. One person moved to Toronto from another city where she had consulted many doctors and taken psychiatric medications. Bad side effects made her worse. Supposedly bipolar, she had pernicious anemia (an underlying medical problem, a deficiency of vitamin B12). Her doctors knew about her p-anemia diagnosis but they did not know that it caused her ‘bipolar’ symptoms or how to treat her restoratively. She soon recovered when Jonathan Prousky treated her with a vitamin B12 supplement (without fillers). During the first meeting, Jonathan listens carefully and gets to know each patient. After diagnosing, he recommends complementary nutritional supplements and suggests an appropriate diet. As the patient recovers, he gradually adjusts the regimen. A qualified health professional and a medical college instructor, Dr. Prousky practices restorative care and teaches orthomolecular methods. Another referral involved a young lady, diagnosed with a bipolar disorder, who also had problems taking medications. She improved taking the True Hope regimen, and supplements which Dr. Prousky recommended. He communicated with her psychiatrist. So far, her progress has been very good as long as she takes her treatments every day. Her regimen includes vitamins, minerals and amino acids. These supplements, also called Empower Plus, have helped many patients with bipolar disorder but not as many with schizophrenia or autism. Most people who call have been through a tough time with their illnesses. Unfortunately, medications can make some sick people worse. That happened to me! Misdiagnosis and mistreatments nearly cost me my life. Please note – I am not opposed to psychiatry or medications or talk therapy. Obviously they help. However, if substandard short cuts make sick patients WORSE, I encourage them to seek second opinions and ask for guideline-quality care. Suicidal thoughts are often a symptom of the lowest point of a mood disorder; even though you feel bad, do NOT hurt yourself!Instead consider restorative treatments which researchers tested and found safe and effective. Summary – You Can Find Restorative Care for Mental Illness – even in Toronto! Mental disorders are painful. After more than 40 years with my bipolar brain, I know! If I could recover after years of episodes, bad moods and other problems, you can too. Just because you read one book, do not assume you know it all. Instead, you can study several books and ask your health professionals to test you carefully and diagnose the root cause(s) of your symptoms; then you can ask them to recommend safe and effective treatments, discuss the risks and benefits and get your informed consent for treatments, especially medications. After years of illness, many patients despair. Some get so sick that they find it hard to act in their best interests. Eventually patients reach their lowest point; some take their own lives; but others still hope for quality care. Obviously they want to recover. Even the sickest patients can be helped, restoratively, but someone has to mention that orthomolecular care can complement their pills. If you read about orthomolecular medicine, you will learn about safe, effective and restorative care. With an accurate diagnosis and guideline-quality medical care, you can recover. You can find and consult health professionals who complement brain pills with nutritional supplements. Recovery after years of mental illness does not happen overnight. Within 90 days on a restorativeprogram, many patients feel better. Maybe they do not become perfect, but recovered patients can restore their health to the point that they can finish their educations, resume their jobs and fulfill their destinies. I look forward to meeting you, discussing books and sharing information. PS – don’t keep secrets! Tell your friends about restorative care. You can copy Orthomolecular Recoveries x36, the short reading list, and pass it on. The concept: a few good books can help you find restorative care for depression and other brain disorders. Most people suffer during episodes of depression, anxiety, bipolar disorder or schizophrenia. With doctors overloaded and the healthcare system focused on saving time and money, patients risk shortcuts and substandard care. Misdiagnosed and mistreated, patients can get sicker. If you get worse, do not despair or give up. You can choose to take control of your health issues and set up a self-study program. Diane Dawber wrote Reading to Heal in which she explained how the right books can teach you about diagnosis and treatments, encourage your progress and guide your recovery. You can use this short reading list to help yourself or a loved one. Even if you have symptoms and side attacks during episodes of depression or a serious mental illness, you can still read, find help and renew your hope. 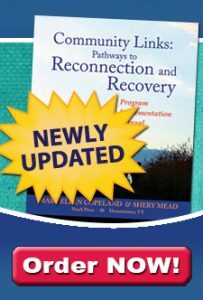 You can learn a lot from books written by patients who recovered and you can also learn from books written by health professionals who diagnose and treat patients – restoratively. combines standard treatments with complementary healing regimens. 7. if necessary, 2nd consult with doctors, nutritionists and naturopaths who offer restorative care, including nutritional supplements. Journal of Orthomolecular Medicine (ISO M).